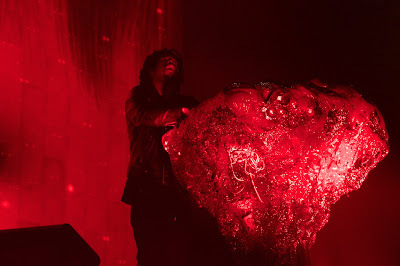 Renowned electronic producer and beatmaker Flying Lotus, born Steven Ellison, has been releasing music and amassing a passionate following for over a decade now, but hadn't made a Kansas City debut until Thursday night. The 70 minute outing featured music from all over his catalog, as well as tracks he'd worked on with close pals Thundercat and Kendrick Lamar, and an ominous flip of dialogue and music from Twin Peaks. Fans were handed plastic 3D glasses as they entered the theater, allowing them to view an array of bizarre, mostly outer space-themed visual effects on the screen behind Ellison. Ellison hardly attempted to engage an audience which sat silent for a majority of the performance. It was tough to gauge whether fans were bored or simply too entranced by the production. A few moments that prompted the room to come alive were short bursts of robotic squeals that seemed to be Ellison's answer to the flashiness of mainstream EDM. The other moments, which were arguably the show's finest, were when Ellison grabbed the mic to rap as his alter-ego Captain Murphy. Many folks couldn't contain their excitement as the cartoon of Murphy flashed on the screen and Ellison skipped across the front of the stage. Dallas rapper So-So Topic performed a set that was honest and energetic, yet hit-or-miss. A nerdy, upbeat rap over Thundercat's "Them Changes" evoked laughs and smiles from those paying attention, but other songs lacked the memorable hooks that they needed. Los Angeles musician Seven Davis Jr. provided a potent mix of pulsating house rhythms, R&B vocals, and P-Funk-esque songwriting. His set could've been a hit at a packed house party, but the crowd couldn't quite latch on to Davis who was isolated on the big stage. Sound problems and half-baked lyricism also contributed to this lack of connection. PBDY, another Brainfeeder signee and Los Angeles resident, both opened the show and directly preceded Flying Lotus with creative sets that pulled heavily from mainstream EDM and modern hip-hop.